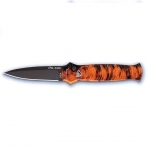 Piranha Knives specializes in automatic knives with aluminum handles. They offer plain and combo edge on most knives, and most are actuated by button. Their knives are available in an assortment of color combinations so you are sure to find a style that suits your taste. Below is a chart showing the best Piranha Knives knives on the site as reviewed by multiple users. Keep in mind that there are many great Piranha Knives knives out there, but if you can't decide on one after searching the site, choose one off this list and we are confident that you will be happy!